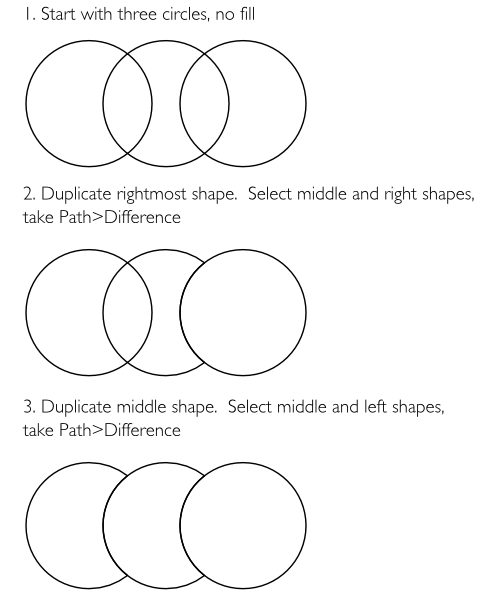 If you have multiple objects which overlap in an inkscape drawing, how do you make eggbot draw the outline of the combined objects instead of drawing all the separate objects? I've tried everything I can think of including grouping boolean paths, etc. In all cases eggbot draws all the objects even though the drawing in inkscape is seen as one. I'm not sure exactly what the situation is here. To preview what the Eggbot will actually draw, select all, and then ungroup everything. Turn the fill type to "no paint" (none), and select a consistent stroke width, say 1 px. Then, you'll see all the same lines that the Eggbot will. If you want to draw the outline of a set of path objects, you might try using the "Union" operation under the Path menu to combine them together. I see what you mean, Windell. But what I want is for the fill to be, say white, so that only the outline of the objects is seen. If you have two circles slightly offset with no fill you see two circles, but with a fill you will see only on full circle, or if you do a union you see a constricted oval. Is there a way for eggbot to draw those? I stand corrected - by using Path, Union command eggbot does what I want it to do. I'll have to go back to the drawing I was working on to see where I went wrong. The Eggbot draws with a pen, and consequently it is designed to only draw lines. It does not, on its own, see fills. The guideline that I posted above will allow you to see where the lines are in your drawing, and therefore, what will actually print. If you want to fill a region in with white ink, that's certainly possible, so long as you have a white pen to use. Otherwise, it sounds like what you really want to do is to use the Path>Difference operation to subtract a white-filled region from a black-filled region. I don't really want to show the fill. 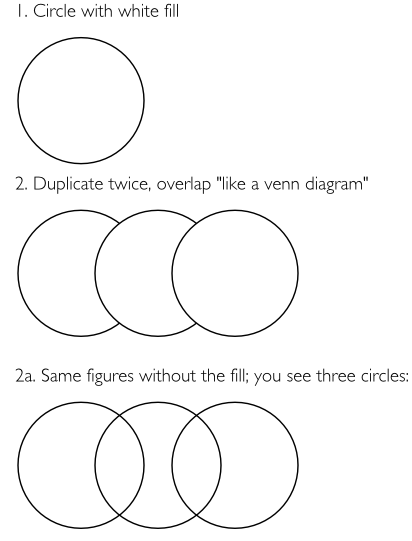 Try this - draw a circle with a white fill, duplicate it twice and overlap them like a venn diagram. Don't adjust anything so that circles are in front of each other. Can that figure be drawn by eggbot, without showing the complete circles? Without the fill one sees three complete circles. Thanks Windell. That's what I'm getting at, and a solution. So for a more complex figure (I don't know how to show one like you did) one would need to go through a lot of convolutions. > So for a more complex figure (I don't know how to show one like you did) one would need to go through a lot of convolutions. If you have a specific graphic that you'd like advice on how to prepare for use with the Eggbot, please feel free to either post a link to it here, or contact us directly via the contact form or e-mail. We'd be happy to help. Sorry about being a little dense, but how do I email you to attach a vector diagram, or how can I do that on the forum?